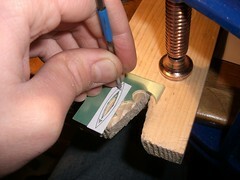 Since I have never used a graver before, let alone to set a stone, I practised first on a piece of scrap brass. It was fairly straight-forward to set the one of the diamonds. 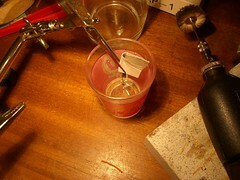 A flickr set documents the experiment here, but I will describe the whole setting process in the context of the pendant. I designed the pendant in inkscape, as shown below. The SVG can be downloaded here. 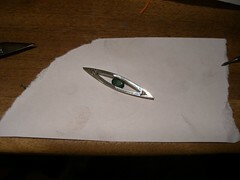 I made the central cutout 0.5mm undersize, so the emerald would be a nice tension fit. 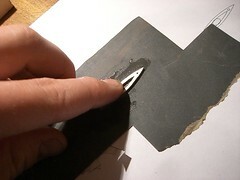 ...and a sharp scriber was used to punch the centre of the setting holes. 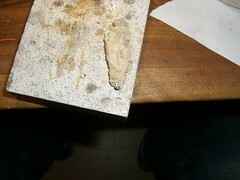 Next I cut the seat for the stone using a 1.5mm stone setting burr in the same drilling setup. 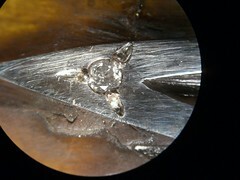 By eye I drilled to a depth at which the table of the diamond would be just above the surface of the silver. 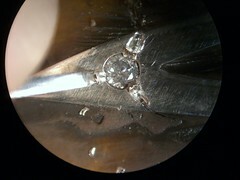 I test fitted the diamonds a few times during this process. 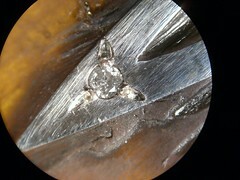 The 1.5mm burr was slightly too small for the diamonds, so I used a 1.6mm bearing cutter burr to enlarge the hole. Some explanation is probably required here. The hole profile we're aiming for is shown in the diagram. The "seat" or "bearing" supports the bottom of the stone. 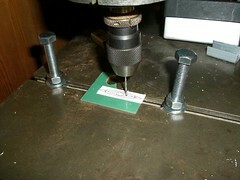 The 1.1mm hole provides a starting point for the cutter (the fine cutting burrs are not designed to remove large amounts of material). 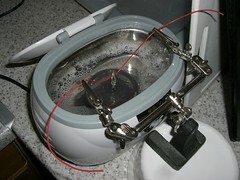 It also allows light to reach the back of the stone, and is an aid in cutting the azures. More on that later. I forgot to take a photo of using the bearing/stone setting burrs, but it would look pretty much identical to the drilling in the previous step. The finished holes are shown, however. If you zoom in to the full size (via the flickr All Sizes button) you'll be able to get an idea of the hole profile. Next I tidied up the inside walls of the cutout. I used needle files to level out the big bumps, then drawfiled (moving the file perpendiular to its usual direction of use) to a reasonable finish. Since i couldn't get a file into the very ends of the cutout (they taper to a very fine point) I used a scalpel to shave away excess silver and define the sharp tips of the hole. Once all that fiddly stuff had been done, I pierced out the outline of the pendant. Here it is initially roughed out. I tidied up the edges with a file, and prepolished with 1200 grit wet paper. 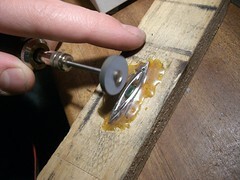 Then I drilled a 0.8mm hole sideways through the top of the pendant to accept a jump ring later on. For some reason the drill bit doesn't feature in this photo! I did most of the polishing with carbide-loaded silicone wheels. 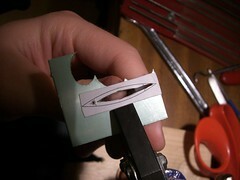 I used this handy knife-edge one to get into the cutout. 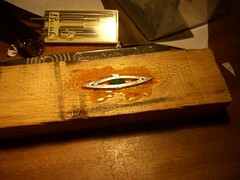 Next I cut two grooves in the walls of the cuout to accept the emerald. I didn't take a photo, and I can't quite remember, but I think I cut them with a 2mm bearing cutter. This photo is a bit rubbish, but if you zoom in you can just make out the groove. I also foolishly neglected to photograph the stone setting procedure. It was dead easy - just lined up one edge of the emerald in one groove, and pushed in the protruding edge using the table top and my fingers. It went in with a nice satisfying snap, indicating a good tension fit. Once the emerald was set, the tricky bead setting of the diamonds was the next job. Cutting the beads involves delivering a large and very precisely controlled driving force to the gravers. This is obviously going to be a complete nightmare unless the piece is very securely held. 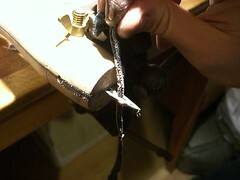 A vice is cumbersome and care must be taken to avoid marking the silver. In the case of this pendant a vice would be catastrophic as the only available clamping sites would push right on the edges of the emerald. I got a piece of sturdy plywood that wouldn't deform under the pressure of the graver, and drilled a hole to clear the back of the emerald (it protrudes slightly from the back of the pendant). 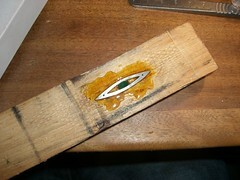 I melted some of a shellac stick onto the wood. Shellac is an incredible material. 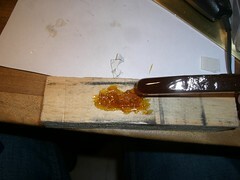 It's a dark orange, hard, glassy material that melts initially a bit like sugar; entering first a soft, pliable stage, then a very runny stage like molten wax. It has a nice smell, something like a cross between pine resin, toffee and musty drawers, and it is even soluble in warm alcohol! 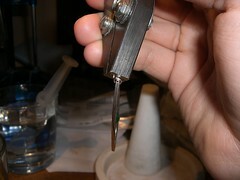 I melted the pendant into it using my hot air soldering station, set to very low. 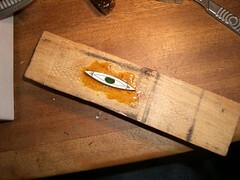 Here's the pendant set into the hard shellac. It's very well attached to the wood. 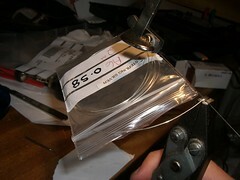 I took the opportunity to finish most of the polishing whilst the pendant was conveniently held in the shellac. Stone setting time... I used the 0.4mm round graver to cut the beads. 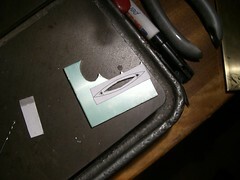 First I made three very light cuts using the scalpel marks from before as a guide. These light cuts just formed a visual guide to ascertain whether the finished beads would be equidistant from eachother, and arranged correctly relative to the outline of the pendant. 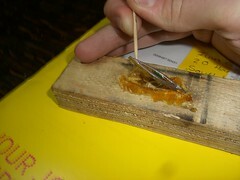 They also formed guides for the next stage - a deep cut to form the bead. This is the most crucial stage - raising the beads. It demands good control of the graver to make the three beads the same depth and size and to leave the groove with a good finish. The aim here is to make a straight, deep cut into the silver, leaving a nice uniform, tapering groove with a good finish and, crucially, a fair sized "prong" of metal raised from the surface which will later form the nice, rounded bead. Note the beads are purely decorative - it is the pushing in of the walls of the hole that grips the stone in place. Extreme care must be taken to stop the cut before reaching the edge of the hole! 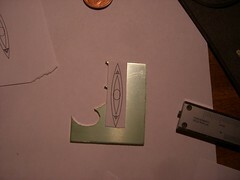 If one slips and extends the groove all the way to the hole, cutting off the prong, then the piece is ruined. 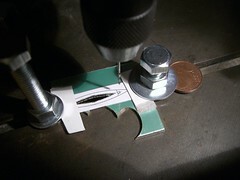 It is important to increase the cutting angle to almost vertical as you get near the end of the cut. 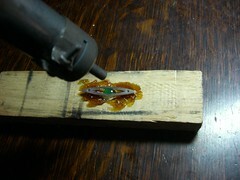 This pushes the prong up, out of the surface, and will produce a nice bead later. 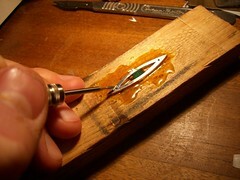 The prong must be one solid piece of silver, so it must be raised in one large cut. 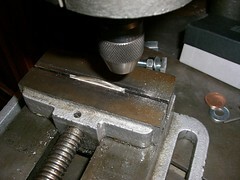 Some final light cuts can be used to neaten up the groove, but nothing should be removed from the prong - all that metal will be needed to form the bead. 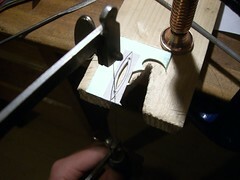 The photo shows me cutting the third prong. 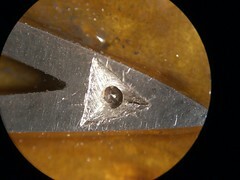 Note how the wall of the hole curves in to grip the diamond. There I'm only about 2/3 of the way through the cut and already the wall has squished a fair way into the hole. I should stress at this point that magnification is absolutely required for the setting process. 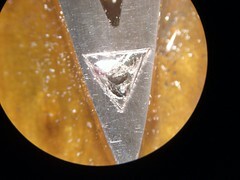 Have another look at the photo - the diamond is 1.5mm diameter, and the cuts I'm making are only 0.75mm long and maybe 0.5mm at their widest points. I used a x20 stereo microscope. The setting ready for beading. The grooves are symmetrical, all the same size and have a good surface finish. 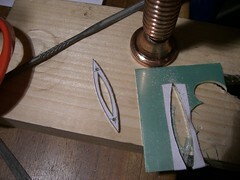 Now it is time to convert the sharp, ugly, jagged prongs into nice smooth domes (beads). 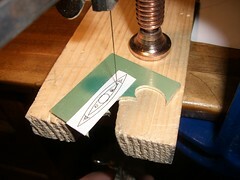 For this a beading tool is used. It's simply a steel rod with a polished, concave hemispherical dent on the end. I used a No. 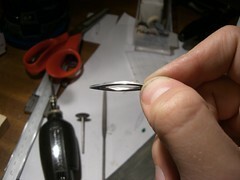 4, which is 0.45mm in diameter, but it was a bit too big. Next time I'd use something around 0.3mm. It's pretty easy to do - just locate the dent on the raised silver prong, and gently push down, jiggle around, and rotate to burnish the prong into a nice polished dome. I biased my pushing towards the stone, to avoid simply pushing the prong back down into the groove it came from. The second photo shows two finished beads (top left and right) and an unfinished prong (bottom). The lighting isn't great but you get the idea. It makes a surprisingly big difference in real world, out of the microscope. 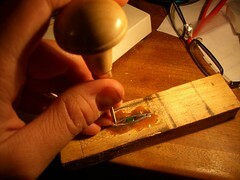 Once I'd set both diamonds I melted the pendant out of the shellac and flipped it over. of the piece more interesting and get light to the back of the stone. the same. I think you'll agree the back doesn't look very interesting at the moment. I stuck on a template for the azures. 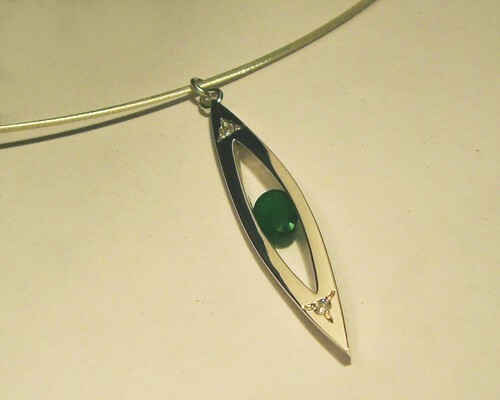 I thought some triangular pyramids would complement the shape of the setting and pendant outline nicely. I used a scalpel to scribe the outlines of the azures, then removed the template. 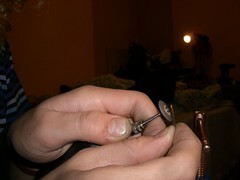 Then a 1.4mm flame burr was used to remove as much metal as possible from the corners of the azures. The azure after the flame bur. Note the scribed guide lines. 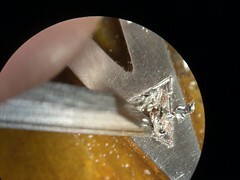 The azures were then cut with a 0.8mm flat graver. Nothing special here - if you've ever done any joinery/wook carving you'll know how to control a chisel. It's pretty much the same deal. The finished azure. Repeat at other end. The whole pendant at this stage. 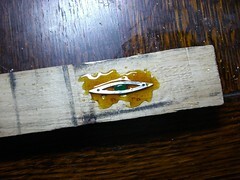 I melted it out of the shellac and cleaned it off with warm alcohol. 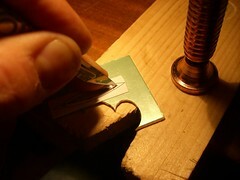 ...and cut off the excess with a fine jeweller's saw. I closed and soldered one, then closed the other one around it and the pendant. 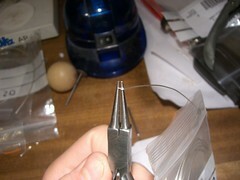 Then I soldered the second one. Since it was attached to the pendant, this required some care. I coated the pendant in a generous layer of heat protective paste. I pickled the rings, but kept the stones out of the solution. I finished the polishing with liquid silver polish. To get to the inside walls around the emerald I used a bit of old sock in a dental-floss style action, holding the pendant in a soft-jawed ring clamp. Finally I cleaned off the polish and other crud in the ultrasonic bath. I kept the emerald out of the bath because apparently they can be damaged quite easily in this process. I really enjoyed making this piece. I'm particularly pleased with the bead settings and the azures on the back. If I were to do it again, I'd polish the flat graver to a mirror finish, which would impart a better finish on the walls of the azures. Using the gravers was a valuable lesson which has paved the way to more complex work. For some extra photos, have a gander at the flickr set . Submitted by GloverGina (not verified) on Thu, 02/02/2012 - 03:55. Following my exploration, thousands of people all over the world get the mortgage loans at well known creditors. So, there's a good possibility to find a short term loan in any country. Submitted by Anonymous on Mon, 04/01/2019 - 10:33. Submitted by Anonymous on Mon, 04/09/2012 - 12:40. Submitted by Anonymous on Sun, 07/26/2015 - 17:36. Useful info. Lucky me I discovered your website by accident, and I'm surprised why this twist of fate didn't happened earlier! I bookmarked it. Here is my webpage: ????????????? Submitted by Anonymous on Sun, 02/28/2016 - 05:57. A Humble Reminder - There is a reason why text messages have a character limit - 160 to be exact. When one parent has more lax rules about do my algebra homework, it's harder to enforce more firm rules in the other's home. From the Cinavia technical pages and other technical sites; all later editions PS3 and bluray players have Cinavia drm built-in via hardware and ENABLED. Submitted by Anonymous on Fri, 12/08/2017 - 04:06. Submitted by Anonymous on Mon, 10/29/2018 - 17:28. Submitted by Anonymous on Wed, 08/15/2018 - 02:04. Submitted by Anonymous on Sun, 02/28/2016 - 01:16. Submitted by Anonymous on Mon, 12/10/2018 - 15:16. Submitted by Anonymous on Tue, 03/26/2019 - 08:58. Submitted by Anonymous on Sun, 07/22/2012 - 21:04. Our finest earning is our clients' satisfaction. We present our link stuff at our url submission directory service are created with a purpose to help internet sites owners having greater incomes. We are always concentrated on success and we always can get that! Submitted by Anonymous on Thu, 08/02/2012 - 19:07. The really good release about this good post would be free for students, just because they demand thesis writing service and professional dissertations or just writing thesis. Submitted by Anonymous on Tue, 03/19/2013 - 14:40. Submitted by Anonymous on Wed, 11/23/2016 - 19:14. Submitted by Anonymous on Mon, 10/16/2017 - 17:35. Submitted by Anonymous on Sun, 10/22/2017 - 15:19. Submitted by Anonymous on Wed, 08/12/2015 - 03:07. Submitted by Anonymous on Wed, 02/17/2016 - 15:01. Submitted by Anonymous on Fri, 07/21/2017 - 09:56. Submitted by Anonymous on Mon, 09/17/2018 - 10:49. Once you decide to use the services of those sites where sports betting is done, maybe you have encounter to obtain be aware of topic, 'sportwetten bonus. Great players are unpredictable in this manner, that may be a sizable risk and reward strategy. So participate in online lotto programs and obtain an opportunity to win huge amounts. My blog post: ?????? Submitted by Anonymous on Sat, 08/11/2012 - 01:17. Some years ago I did not hear words like linkbuilding! Guys created cheap seo services cheap-link-building.com not long ago! Nevertheless, such organizations became popular. I think that is worth to try to use linkbuilding services. Submitted by Anonymous on Sun, 12/23/2012 - 18:44. Submitted by Anonymous on Mon, 06/27/2016 - 13:33. Submitted by Anonymous on Sun, 07/15/2018 - 03:47. Submitted by Anonymous on Sun, 09/13/2015 - 10:10. Submitted by Anonymous on Sun, 04/03/2016 - 23:55. Submitted by Anonymous on Wed, 05/11/2016 - 09:21. Submitted by Anonymous on Mon, 09/04/2017 - 01:28. Submitted by Anonymous on Sun, 06/17/2018 - 07:19. Submitted by Anonymous on Mon, 04/11/2016 - 04:42. Submitted by Anonymous on Sat, 12/01/2018 - 08:30. Submitted by Anonymous on Sat, 11/24/2018 - 02:42. Submitted by Anonymous on Tue, 08/14/2012 - 03:47. I had to create a lot of various papers, such as world-literature essays, but I did not have enough qualifications for those assignments. Submitted by Anonymous on Thu, 12/03/2015 - 18:19. Submitted by Anonymous on Wed, 03/23/2016 - 18:28. Submitted by Anonymous on Sat, 04/02/2016 - 00:57. Submitted by Anonymous on Tue, 03/28/2017 - 15:52. Submitted by Anonymous on Tue, 04/05/2016 - 05:49. Submitted by Anonymous on Mon, 12/12/2016 - 16:58. Submitted by Anonymous on Wed, 03/21/2018 - 16:48. Submitted by Anonymous on Tue, 07/12/2016 - 13:25. Submitted by Anonymous on Thu, 01/10/2019 - 10:44. The ability to pay for a pet's injury, sickness, and medical needs are greatly covered by these offers. And alterations that create an economic liability increase for the Insurance Policy company, including the augmentation of death benefit, will result in a new two-year contestability period. It's easier to preserve your overall independence and lifestyle by choosing:. Submitted by Anonymous on Mon, 07/31/2017 - 17:08. Submitted by Anonymous on Fri, 08/17/2012 - 15:22. Wow, superb release about this good topic. Would wish to let me know how long period of time it will take? Because I want to accomplish some thesis examples or may be it will be better to detect the buy dissertation service. Thank you very much. Submitted by Anonymous on Thu, 02/04/2016 - 22:08. Submitted by Anonymous on Wed, 01/16/2019 - 22:35. Submitted by Anonymous on Sun, 08/20/2017 - 09:49. Submitted by Anonymous on Tue, 08/21/2012 - 22:27. There is the pile of students who are not able to realize how it is real to hand in well done papers without any assistance of companies wich offer to buy custom research paper. Submitted by Anonymous on Sun, 04/03/2016 - 21:09.